Let me start by saying that it is no understatement to say that Corrosion Of Conformity‘s latest studio record, “No Cross No Crown“, is one of music’s most anticipated album releases. Not just for the year 2018, but hell, for the last five years, or a decade for that matter and it is out now from Nuclear Blast. This record marks the return of guitarist / vocalist Pepper Keenan to the fold, his first album with the band in twelve years. I personally feel that No Cross No Crown picks right back up where the Pepper-present 2005 effort In The Arms Of God left off. More than that, it impresses the fact that the legendary band’s ongoing longevity is duly strengthened with this next brick in the wall of their ultimate legacy. C.O.C.‘s tenth studio full-length goes far in melding the vibes of past releases from the previous Pepper era, particularly Deliverance and Wiseblood. Yet, I think it also hearkens back to the first album to feature then-guitarist Keenan, 1991’s Relativity outing, Blind. Like that record and Deliverance, No Cross No Crown once again utilizes brief, but powerful, musical interludes between many of these tracks, something derived from early Black Sabbath records. Pepper and core band members Mike Dean (bassist / vocalist), Woody Weatherman (guitarist) and Reed Mullin (drums) inject fluid cohesion into this album with poignant pieces like “Novus Deus“, “No Cross“, “Matre’s Diem” and “Sacred Isolation“. These aural glimpses allow for mood-setting stitching in that they are melodically tranquil inserts, channeling peaceful calms before the turbulent salvos of explosive southern hard rock songs incinerate the speakers. Once you delve into the very heart of this album – incendiary tracks “The Luddite“, “Cast The First Stone“, “Little Man” and “Forgive Me” – each one brandishes deep, heavy grooves both in their guitars and rhythmic backbones, while Pepper’s vocals, although noticeably changing with age, are rendered with top notch effect. With 15 tracks and nearly almost an hour playing time, the guys definitely explore all the musical realms touched upon in past efforts. I feel that around the middle section of No Cross No Crown, there is an evident shift toward heading into doomy, somewhat more psychedelically-imbued music at times. Those two types of vibes are clearly at work within the profoundly serene, semi-ballad styled “Nothing Left To Say“. With somber, melancholy verses that offer us the insightful look at real life as only C.O.C. delivers, Pepper croons away in his unique southern drawl-inflected vocals, while the choruses unfold with thick heaviness. That turning point in the record now takes us down a much darker, more morose path, but one nonetheless profound. The striking stand-out “Old Disaster” arrives and gives me one of my personal favorites from the album. It is an introspective number that rumbles with tightly-knit musical weaves and winds, taking on myriad twists and turns in its’ styling and levels of emotion. That’s followed by the bluesy doom of “E.L.M.“, a resonating number which hints at clear influences from say, Thin Lizzy, in its guitars. They pick and peck away with chugging fierceness, but with tones that hearken back to those masters of the twin axe attack. The more I listen to this song, the more it becomes one of my latest favorites from the record. It is upbeat, lively and driving with its grooving paces, the guys playing, and keeping, it tight. However, it is a totally misleading track when compared to what follows it. That would be the “No Cross No Crown” title track, something altogether profound, yet eerily haunting as it leaves a telling effect once heard. It seemingly does become similar to one of the earlier mentioned musical interludes at times, somber and minimalist in content. Pepper’s sedately somber, barely there whispers of vocals accompanied by distant, serene guitar music. The song is a clear descent into mood-altering psychedelia, its semi Gregorian-like chant-ish additions serving well to set a mood and like the preceding song, renders you unprepared for what’s up next. As the sullen, sluggish slow simmer of “A Quest To Believe (A Call To The Void)” now arrives, it immediately invokes memories of Blind. Make no mistake, this is southern doom in its most visceral and compelling state, crawling along as it crushes all within its way. Reed’s drumming is stellar here too, his thunderously heavy-handed style renders a flurry of strikes and activity, all in a total contrast to what else is happening within the number. Running a little over six minutes in length, this song stands out with a monolithic presence and leaves nothing to ones’ imagination. We arrive at the last song, a cover of Queen’s “Son And Daughter“, as it rolls out with a spoken sample intro, a seemingly faux Brit announcing the track and “take 1” to begin things. Once they do, we are pulled into another movement of huge southern doom and blues, some things that are definitely paramount on this album. The guys do not stray too far from the original though as things pick up a little at times within this cut, but by the time the band commits to the increased pacing, the end seems to quickly come as well. 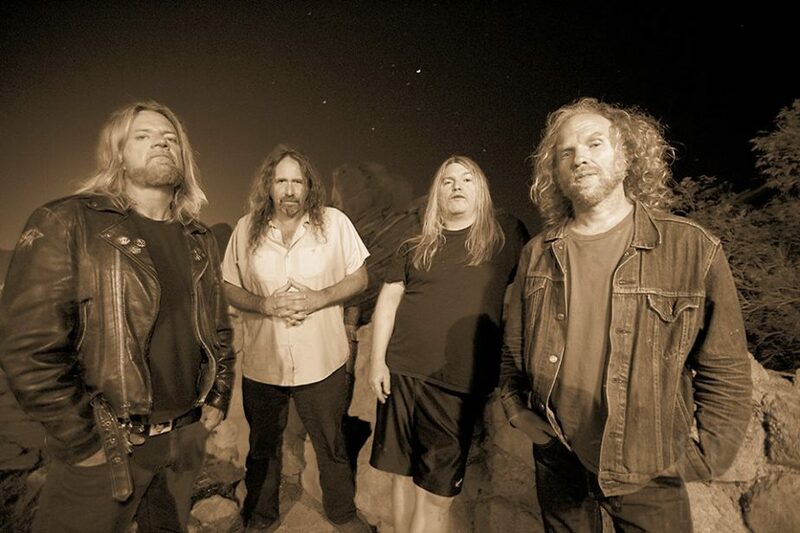 The return of Pepper Keenan to the Corrosion Of Conformity house is one of heavy rock’s more anxiously awaited events in recent times. Both longtime fans as well as more recent joiners to the C.O.C. cabal have clamored for this event and now we have proof positive that the “reunion” is real. It comes with a clear-cut sign of the times too though, that we are all getting older and it is very likely that age has a defining influence on us. With “No Cross No Crown“, Corrosion Of Conformity seem to be playing to their strengths ultimately. The quartet know where they want to go musically, as is evident by their writing this album in the studio with the band’s longtime producer, John Custer. That assured certainty does come, despite the passing of time, as this five man grouping last wrote and recorded together on 2000’s America’s Volume Dealer. Age, experience, and the insights provided by both, are channeled into this music so there’s no need to tamper with what works. In this case it is a southern-infused heaviness tempered with melodic nuances, that being more than enough to power this vessel. With “No Cross No Crown“, C.O.C. have captured many of the things that permeated the band’s past albums with Pepper present for them. I believe that fans of those earlier works will find inflections of them all here, just as I alluded to earlier on, but should also discover where the band is now circa 2018. There is no need for speed so to speak, that being a younger man (or woman’s, whatever) game. Instead, knowing the stakes, the guys created an album that is rooted in the utterly heavier side of their nature but blended in clear batches of soul also. They did not set out to reinvent the wheel nor did they, but they did construct a respectable monument to their own ongoing musical legacy. In closing, allow me to make one suggestion: repeated listenings. I myself waited until I’d underwent a dozen or so listenings of the record, from start to finish, before tackling this review and I have seen other critics speaking about how repeat audibles were of benefit. Ultimately, I believe it will provide a better appreciation for this record overall.